My first taste of Val McDermid, one of the many reading recommendations to come out of my Central Asia Overland trip this autumn. A chance find in the Barbican Library, and doubly serendipitous as the first half of the book takes place in St Andrews. 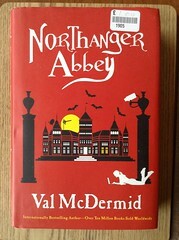 It was a bit strange reading a murder mystery set in the sleepy streets of my alma mater, with four Fife Park students as the main suspects in the murder of their local pub’s Strathkinness barmaid. The plot kept me guessing until almost the end and the nostalgia factor was high. I did guess whodunnit though.